Our youth group is a combination of Jr. High (7th – 8th grades) and Sr. High (9th – 12th grades). A typical night at Impact involves games, a time of worship, a message and small group time. 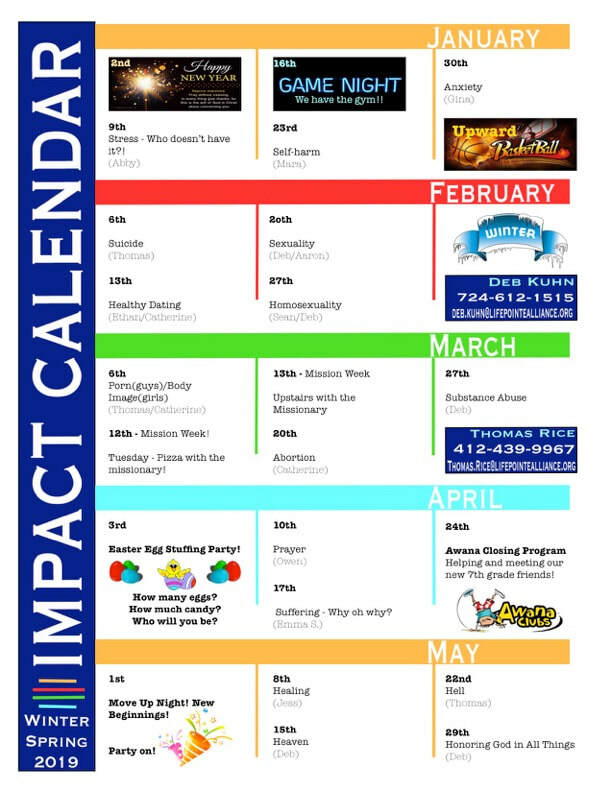 Impact small groups consist of four to eight students, in an age and gender specific environment, with a leader to facilitate discussion of the topic of the evening, and what is going on in their lives and the culture that they live in. Throughout the year, Impact students have the opportunity to participate in many activities such as random acts of fun, back yard gatherings and bonfires, service projects, summer trips, camps, retreats and other opportunities that arise, giving plenty of time to grow together as brothers and sisters in Christ. The purpose of Impact Student Ministries is to partner with parents, and disciple teens, helping them to grow spiritually and personally strong and faithful to Jesus Christ our Savior. We are blessed to partner with parents in such a critical time of their child’s life, being a support team as they lead their teens into a God Honoring adulthood. We strive to give students an opportunity to serve, and to cultivate an atmosphere where students can develop relationships with other students, leaders, church family of all ages and ultimately, and most importantly, Jesus Christ. Wednesday Nights: 6:50 PM – 8:30 PM in the Impact Cafe and Fishbowl during the school year. Times may vary slightly during the summer months with a Saturday event scheduled in occasionally. These changes are clearly communicated on Facebook, Instagram, and the web site calendar (below) when they are planned. Sunday Mornings: 9:30 - 10:30 AM - 7th – 8th grades in the Fishbowl, 9th – 10th grades in the Bird Cage and 11th – 12th grades in the Cafe. All of these are dedicated youth rooms in the youth wing. Download and print the trip release form below, for any trip or retreat that your student is attending with Impact Student Ministry. Return to Deb Kuhn, or to the Church office. What is it about that Life trip?! Check out these videos to get an idea of what is in store for our students!